Boy Scouts Eject Leaders Who Toppled Ancient Rock : The Two-Way The video uploaded by the Scouts went viral and the men may also face criminal charges. The organization said the actions showed a disregard for natural surroundings. A man topples a rock formation from the Jurassic Period. The two men involved in the destruction of an ancient rock formation in a Utah state park have been stripped of their leadership positions in the Boy Scouts of America and drummed out of scouting altogether. A terse statement issued by the Utah National Parks Council of the BSA does not name Glenn Taylor and David Hall but it says "based on the actions of the individuals involved with the Goblin Valley incident, the Utah National Parks Council has removed them from their leadership positions in the Boy Scouts of America." 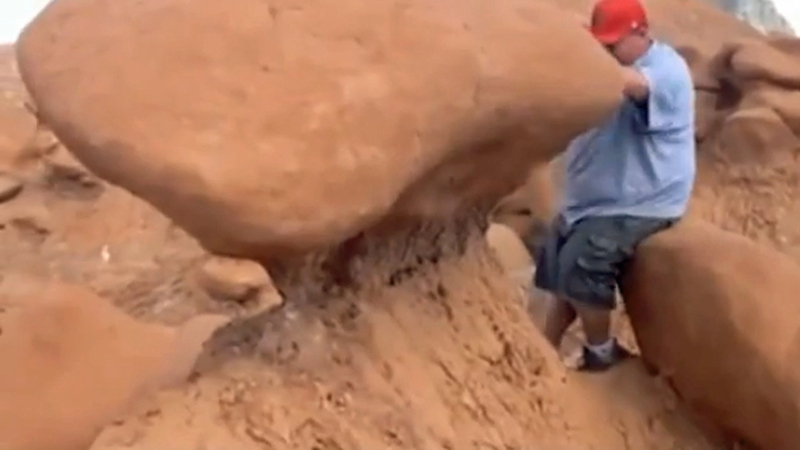 Taylor appears in a video pushing over a sandstone boulder that had been perched on a sandy pillar at Goblin Valley State Park in southern Utah. Hall shot the video and both men hoot and holler and celebrate with high fives after the rock falls. Geologists say the so-called "goblin" formations in the park took millions of years to form. Taylor and Hall have claimed they were trying to protect other visitors from an unexpected and dangerous rock fall. Friday, Utah State Parks director Fred Hayes told NPR, "I don't believe the rock was presenting an imminent danger to anybody.". Shortly after the Utah National Parks Council announcement, the BSA issued its own statement, adding that the two men "are no longer members of BSA." "As an organization that has been a leader in conservation for more than a century we were shocked and saddened by this irresponsible display of behavior and apparent disregard for our natural surroundings," says BSA spokesman Deron Smith. Taylor was "a unit leader, meaning he was responsible for running the Scouting program in his area," according to a story in the Salt Lake Tribune, which quotes John Gailey, the executive director of the National Parks Council. Gailey told the Tribune the incident was discussed with state parks officials, the Utah Attorney General's office and the Church of Jesus Christ of Latter-day Saints, which sponsors most Boy Scout troops in Utah. Taylor and Hall were leading a scouting and Mormon Church outing at the time of the incident. Spokesmen for the Mormon Church have not responded to NPR's request for comment. It's not clear whether Hall had a leadership role in scouting. On Friday, BSA spokesman Smith said, "One is a leader. One is a member." The incident is "still under investigation" by a law enforcement ranger for the Utah Division of State Parks and Recreation, according to spokesman Eugene Swalberg, who has no timeline for referral of the case for possible criminal charges. Taylor may face additional problems. Salt Lake City television station KUTV reported this weekend that Taylor had claimed "great pain and suffering, disability, impairment and loss of joys of life" in a recent lawsuit stemming from a 2009 traffic accident. Alan Macdonald's daughter was the driver who hit Taylor's car. McDonald told KUTV, "He looks like a fairly strong, able-bodied guy to me." KUTV reports this about a conversation with Taylor's attorney: "Taylor's attorney Mark Stubbs says just because his client is beginning to recover from his injured back doesn't mean he hasn't suffered from pain in the past, and he says Taylor's medical bills in the wake of the accident could continue for years." The Tribune reports that Hall "expressed support for the [BSA] decision and the Scouts' mission. He added that he plans to use the incident as a learning experience."